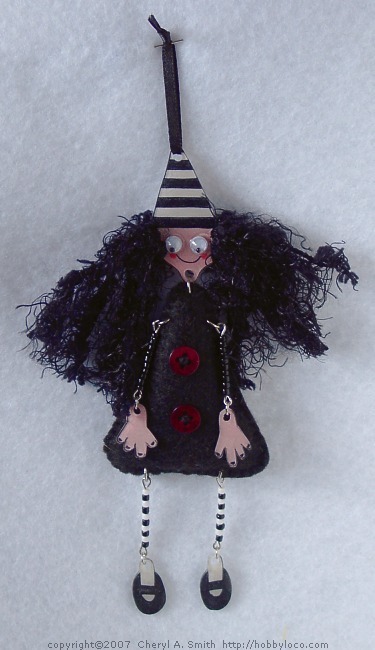 Art Dolls - Mixed Media, Embroidered, Beaded, Shrink Plastic, Plush and More! Art Dolls - Featuring embroidered and mixed media art dolls. 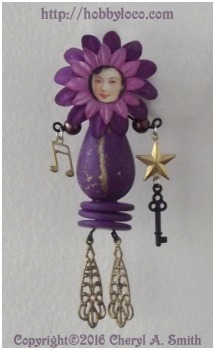 This lavender lovely was assembled from beads, buttons, paper flowers, a printed face, broken jewelry and charms. 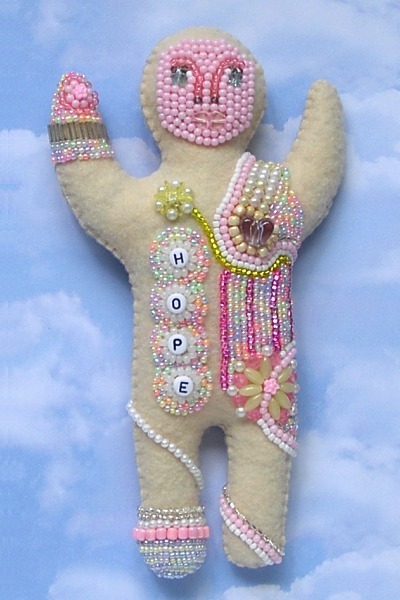 This will be my first completely beaded art doll. *update: After suffering a hand injury and being unable to work on this doll, I packed her away for a long time. Finally ... she has returned and is nearing completion. Below are the most recent images - only her hair and a portion of her back are left to complete. I created a body pattern and cut front and back from felt and stitched them together - stuffing firmly with fiberfill. The body form is about 7-1/2" tall. I started beading the form in 2009 with no particular destination in mind. The selection of beads and the path of the stitching evolved as I worked. 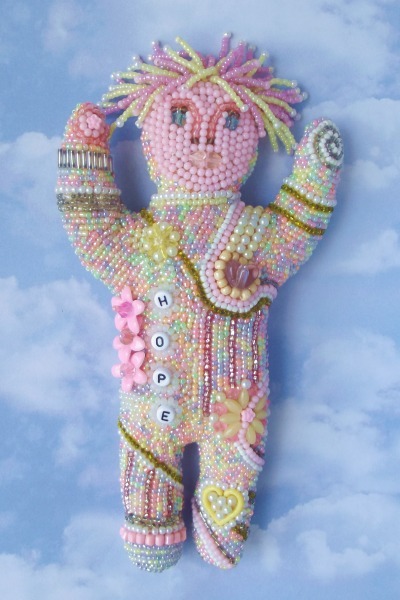 I used a variety of glass and plastic beads to complete this doll, including pressed shapes, alphabet letters and even some glow in the dark beads. Wild Spirit Gallery - Gallery of beaded spirit dolls. 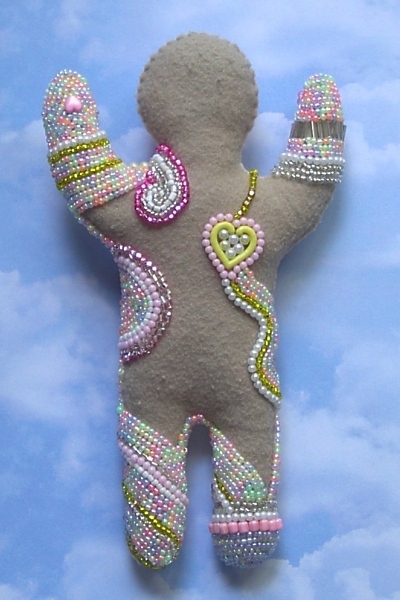 FabArtDIY - Step by step instructions to make a small beaded felt baby doll. 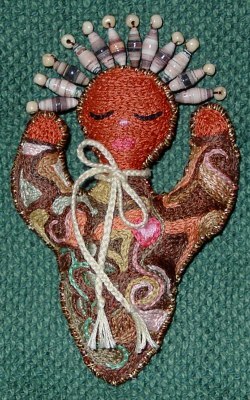 Beaded Art Doll Group - Looks like the group has moved on, however there are tons of photos to enjoy. More Beaded Doll Images - Courtesy of Google. This is the first art doll I made. I created a body pattern and cut front and back from felt. I stitched the front and back with embroidery thread, covering the felt completely with shades of brown, green and gold. I used hand-rolled paper beads across the top of her head, and a braided bow around her neck. This doll measures approx. 4-1/2" tall. "Prima" is short for primary, as in "primary colors". I created this doll in the same manner as the first. However, I only used shades of red, yellow and blue in the doll. Again, I used hand-rolled paper beads on her head, and a braided bow around her neck. This doll measures approx. 4" tall. 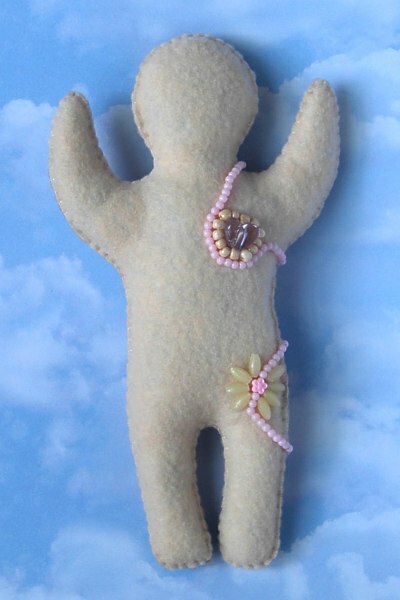 As with my previous art dolls, I created a body pattern and cut front and back from felt. I stitched the front and back with embroidery thread, covering the felt completely with shades of blue, green and violet. 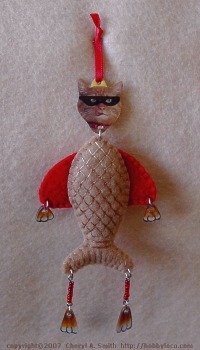 I used small glass beads for sparkle, around the head and tail. This doll measures just under 4". I found some lovely clip art for her face/head, printed on cardstock and colored with Indian ink pens and a clear glitter gel pen. I then coated her head with clear polyurethane. 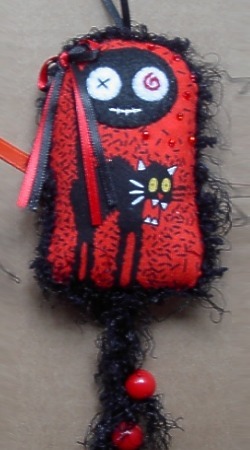 I used a red chenille stem with a loop at the top and a set of square sparkly buttons to form her body. I added red fibers along the length to add a bit of interest. I then glued the head between the chenille stem loop and the top button. I made 2 hearts, crocheted with red thread, to use as her wings. I then glued them behind her upper body. These mixed media button fairy art dolls were created for a swap in one of my art groups. I used public domain images and edited them in a graphics program. I printed the images in black & white on heavy cardstock and embellished them with blue glitter glue. I coated the images with several layers of clear polyurethane, and added iridescent snowflakes. I threaded white buttons and beads onto white chenille stems, bending hanging loops at the top. I then glued the heads to the top of the button bodies, and added white tulle netting for wings. 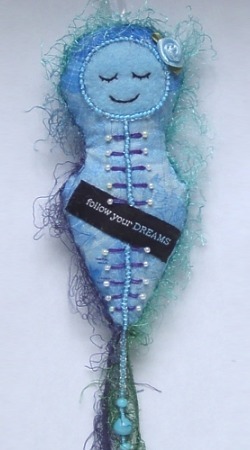 This mixed media ribbon fairy art doll was created for a swap in one of my art groups. I used public domain images and edited them in a graphics program. I printed the images in black & white on heavy cardstock and hand colored them with Indian ink pens and black shimmer paint. I coated the images with several layers of clear polyurethane, and added embellishments. I then attached several lengths of ribbons and glued everything together, adding a small ribbon loop on the back for hanging. 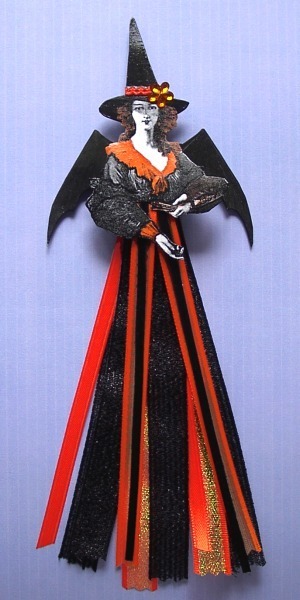 The project was pretty easy & I think this Halloween ribbon fairy is quite bewitching. 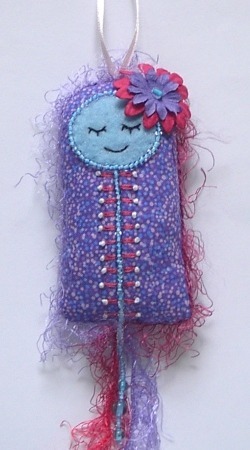 This mixed media button fairy art doll was created for a swap in one of my art groups. Her face and wings were created from public domain vintage art, which I resized and edited before printing. I hand colored both with Indian Ink art pens and added glitter glue to the wings, which I then coated with Diamond Glaze to give them a hard clear coat for stability. I strung an assortment of buttons (the birdhouse is a button, too!) on a green chenille stem for the body, and bent it into a gentle curve leaving a loop at the top for hanging. 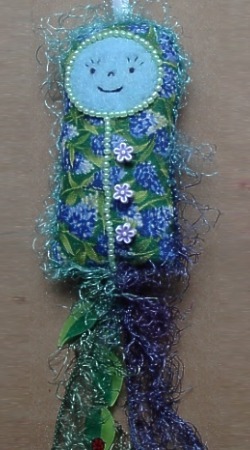 I then stiched blue glass beads to the fronts of the buttons to cover the chenille and add some sparkle. I added fibers to the back of the body and attached the head & wings. I added a tiny ribbon rose to complete the little garden fairy. 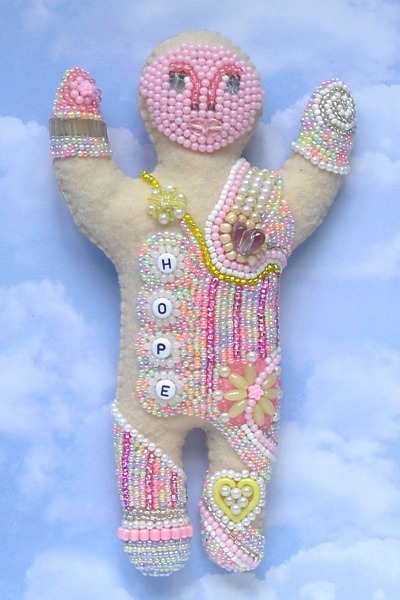 This mixed media art doll includes an embroidered felt body, shrinky dink and beaded paws, and a head made from recycled packaging. Yes, that is a masked Morris the cat! I had the idea to use the Morris photo from a cat food package. I coated the cardboard photo with Diamond Glaze to give it a hard clear coat for durability. 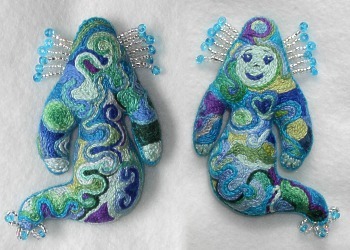 I wanted to make the art doll fun and crazy, so I drew up the pattern for the fish body and used variagated floss to stitch the scale pattern. The paws were created with shrinky dinks plastic. I added some beads for legs and connected all the pieces together with jump rings. 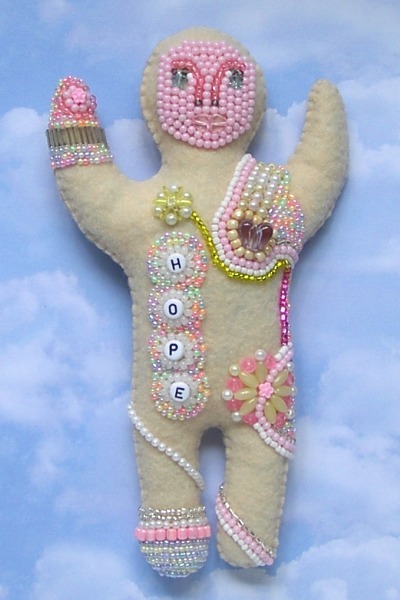 This art doll includes a hand stitched felt body with buttons, shrink plastic head, hands and feet, beaded arms and legs, fiber hair, and googly eyes. I created this art doll for a swap at ATCards.com. 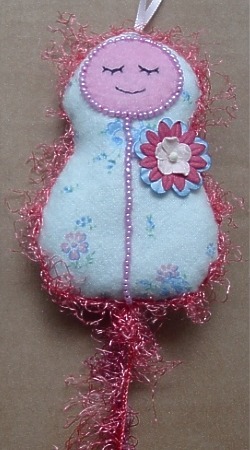 This little art doll was created from an original 9 piece pattern. My colorful "doodle" design was done with a black ultra-fine sharpie marker and colored pencils. I incorporated summertime graphics into the design - a sun, a beetle, a bee, a butterfly, a storm cloud, a sunflower and some vines. 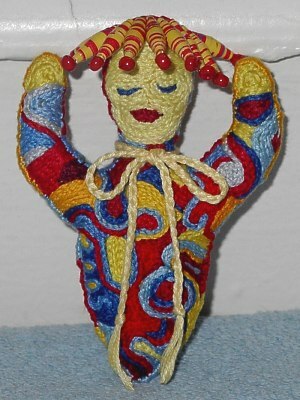 I punched a row of holes across the top of her head before shrinking, and attached colorful fibers to create her hair. 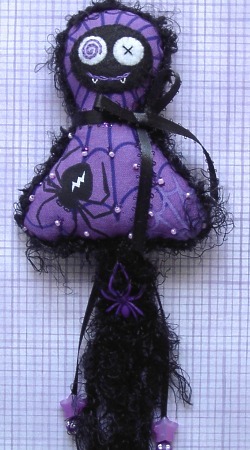 I added the little purple satin rose with craft wire. The body sections were joined using silver jump rings. She measures just over 5-1/2" tall. I am very happy with the results! This project was so much fun! 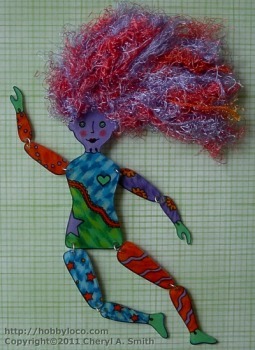 I created another art doll with shrinky dink plastic. I used a regular black sharpie marker and colored pencils. I punched a row of holes across the top of her head before shrinking, and attached colorful fibers to create her hair. The body sections were joined using silver jump rings. This art doll measures just over 7" tall. I am offering the pattern as a FREE printable download on my shrinky dinks page. Inspired by Salley Mavor's Wee Folk, I made this little snow fairy. She is about 2-1/2" tall when standing. She is sporting a white flower petal skirt and white wool top embroidered with metallic gold thread. Her little hat is crocheted from white thread, and her wings are a tiny gold mesh material. She is special to me because the bead I used for her head was mixed in with a box of hobby & needlework supplies that belonged to my Grandmother, who passed away in 2004. I had been saving the bead (which already had the face painted on it) to make something special. 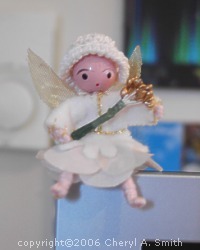 So now I have my little snow fairy to sit on my computer monitor and remind me of my Grandma. The origianl "Dotee" tutorial has been removed, but there are several other tutorials posted online. 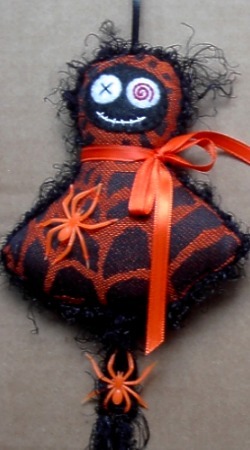 These dolls were really popular around 2008-2009, and are occaisonally still being made and traded online at Swap-Bot. Dotee dolls can be adapted for theme or size, depending on your taste or swap guidelines. Art Dolls group with galleries, info and projects. 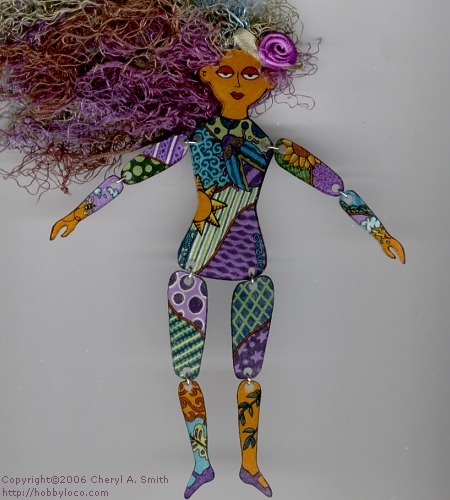 Art group with hosted swaps for paper dolls, dottee dolls, mixed media dolls, and many more! 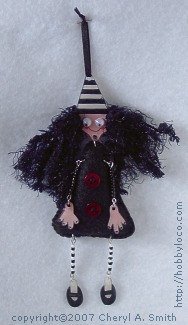 Art dolls of all media (paper, fabric, bead, clay, metal, etc...) and all moods. Thousands of photos to enjoy! 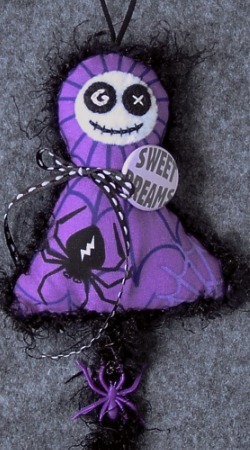 This site features lots of photos and info about all types of handmade dolls, art dolls and plushies.